When it comes to clams there are only two camps. You either really really love them or you really really hate them. As for me I love clams – always have, always will. 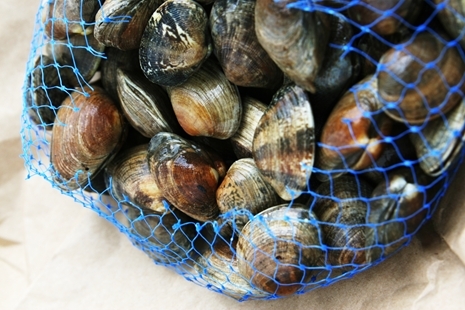 Growing up in the Puget Sound we would go clam digging as kids spending hours looking for those suckers. At the end of the day my mom would prepare our loot by steaming clams and us kids would slurp the savory broth till the lost drop. We would collect all the empty shells, wash them (or not wash them), and store them in a secret box as our treasure. Those were the good old days. Last time I went clam digging was with my husband before having kids. Lets just say it wasn’t as nearly as fun as I remember as a kid, but eating them these days is just as comforting and delectable. My favorite method of preparing and eating them is rather simple and very quick. I like to steam clams in butter, garlic, white wine, and finish it off with some chopped parsley and lemon wedges. 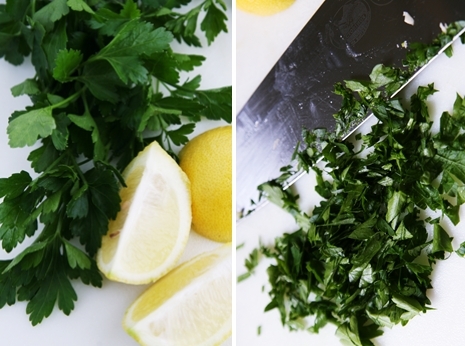 Chopped parsley adds a little earthiness and the lemon slices adds a bit of zest. But in all honestly, neither is as important compared to the butter, garlic, and wine. 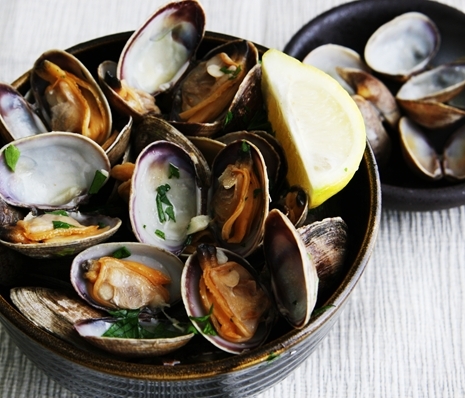 Steamed clams make a great starter dish. Or, if you’re like me, the only dish…the main dish (do not come between me and a bowl of steamed clams, or you might… you might get hurt – just sayin’). I told you I really really loved clams. 🙂 Anyway, I think you get the idea. Enjoy! Melt butter in a medium pot over medium heat. Add garlic and cook for 2-3 minutes until garlic is fragrant but not burned. Add wine and increase heat to medium-high until wine is brought to a simmering boil. Add clams and cooked covered for 5-7 minutes, stirring occasionally, until clams have opened. Discard any clams still closed. Add parsley and give the pot a quick stir. Transfer clams and broth to a large serving bowl, serving with lemon wedges on the side. Enjoy! PS: Don’t forget to have some crusty rustic bread to dip into the clam broth – don’t ask questions, you’ll thank me later. I love this recipe Lynn. Thanks so much for stopping by and letting me know you love it too! Have a wonderful day! I cannot remember how many times I have made this. My whole family loves it! Thank you so much for sharing the recipe. I have made this 5 times & followed the recipe as written. It us awesome!! I love this recipe!! 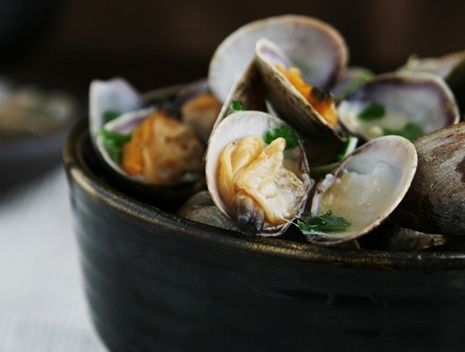 It is my go to recipe for little neck clams. I have made it 5 times & followed the recipe as written. I would not change a thing. Thanks!! I’ve made this recipe 3 times now and I just love it!! I do think the white wine you pickin essential, too! I used The Expedition, Pinos Gris and the flavors were so decadent! I tried using a different wine the 2nd time and it wasn’t as perfect. Anyhow, I just love this! Thank you for the recipe! Love this recipe. It’s my girlfriends favorite thing I make. I do everything the same except I add some red pepper flakes for a little kick. This has been my go to recipe for years. Simply perfect. The last time I prepared this dish I saved the broth (that didn’t get sopped up with delicious bread) in the freezer and used it as the “clam juice” portion in my clam chowder recipe. Equally as awesome. 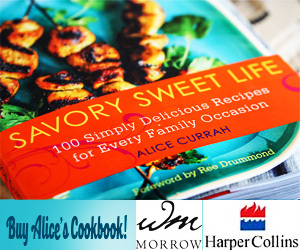 Great recipe, great photos! I use clam juice from a bottle instead of the wine. And closer to a stick of butter. I did clams with a wine sauce much like this once, but in the end my fave way to steam clams is over a fool Wrapped grill over a backyard fire & then dipping them in a buttery garlic Sauce on the side. I think it was the wine taste that tasted off to me the one time I tried it on the stove like this. Why I’m posting this is to ask if you or anyone else can suggest a tweak to this recipe for replacing the wine? Would a little water work instead? 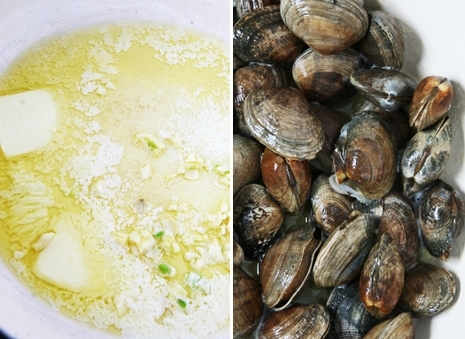 I love the natural juices the clams make when steamed, & dipping it in a butter & garlic sauce is my fave, but I’d like to try cooking them in the sauce , but all the recipes I find call for wine or beer & I personally would rather use something else. Any ideas are hugely appreciated! Have a beautiful day. Great recipe, but please don’t tell me you use 3 tbsp of butter for two pounds of clams… that wouldn’t even get them wet! 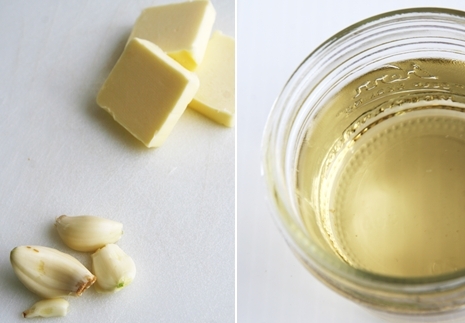 I use at least one stick of butter… and at least one cup of wine… and at least 6 cloves of garlic. That keeps the clams from dring out, and also gives a lot of great broth to sop up with the crusty bread! A shake or three of parmesan cheese doesn’t go awry, either. Thanks for the recipe. I cooked my clams just like this but exchange cilantro or basil for the parsley for a different taste.I make my own sourdough bread and timed it to take out the bread to cool and then make my clams which I have put on ice from the beaches up by Hood Canal Bridge on the Olympic Penn..I usually go once or twice a week from Feb. to closing of the beaches(may15).The beaches further south on the west side are open later in the year and a bit further to drive so I don’t go as often.I also make rustic and lean breads which come out pretty good and require a day or so less to make than sourdough.Oysters can be cooked the same way but must be shucked and I put a good amount of parmesan reggiano on them before serving.Good digging and eating to all. These were delicious, thanks for the great recipe!! Best broth ever! LoVE! Sweet wines work best! Hi Carol, What a sweet story. Thanks for sharing!
. Never again! Your recipe was so easy and the result was a “Harry met Sally” restaurant moment! Many thanks from myself and my “Harry” !